1. 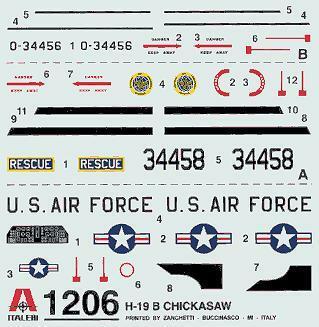 Italeri's 1:72 H-19 Chickasaw #1206 was released in France this week. The kit builds the 'dropped tail' H-19B model with horizontal stabilizers, but there is a large space on the sprue next to the two tail-section halves where we can expect to see a 'straight tail' sometime in the future. There is no obvious provision for any of the later Westland turbine-powered versions. Decals are provided for two US Air Force aircraft; 34458, which is 'silver' with a broad black-bordered yellow band around the base of the tail, with RESCUE and MATS (Military Air Transport Sevice) markings, dated 1957; and 0-34456, which is light ghost grey with a fluorescent red nose and tail band, dated 1959. 2. Squadron / Signal Publications have announced their 'H-53 in Action', #1173. It is due in October, and will cover the type history from origin through the Gulf War; US and non-US operators. 50 pages, 10 colour profiles, 3 colour paintings, lots of black and white photos. 3. Blue Rider's Insignia Magazine #14, Spring/Summer 2000 Issue, includes a Mongolian Air Force article and comes with decals for a Mongolian MiG-21, Mi-8 and Mi-24. 4. Following my digression last week into the murky waters of Vietnam-era boats, I have received several warnings and hard-luck stories about dealing with Viking. I was going to issue a dire warning about dealing with them, but in a newsletter which came this week from Great Models I read that they have gone out of business anyway, which from the sound of it is just as well. If you do get the opportunity to buy a Viking kit, it seems to be imperative that you examine it in person to see how much of it is actually there. 5. In the same newsletter it says that the 1:35 Blackhawks from MRC are delayed until this coming Christmas. 6. 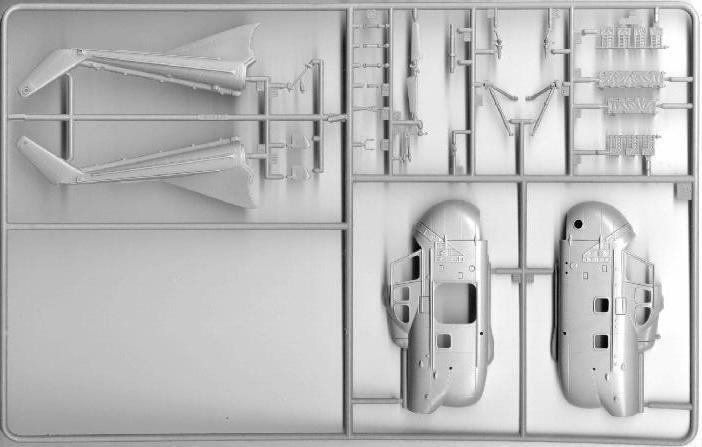 I have a whisper from China that there may be a 1:48 Dauphin 2 in the works. Thanks to Manuel Estevez, Tony Morgan, Keith Walker, and CW Lam.